It is sad to even consider that it is almost time to send the kids back to school. I feel like the summer is just beginning. But, the truth is, school starts for our kids in less than 4 weeks. Ugh, where has the time gone. This year we will have a 6th grader, a 3rd grader and a kindergartner. It is nearly impossibly for me to consider that this is the stage of life we are in. I am sure we just had our first child. And now he is starting his last year in elementary school. There is still a ton to get done before we are ready to head back. On the top of the list is back to school shopping. Shopping isn't usually on the top of kids "favorite things" list. In fact, it can often feel like pulling teeth to get them to participate. The challenge is to get them excited so the experience isn't miserable for everyone. 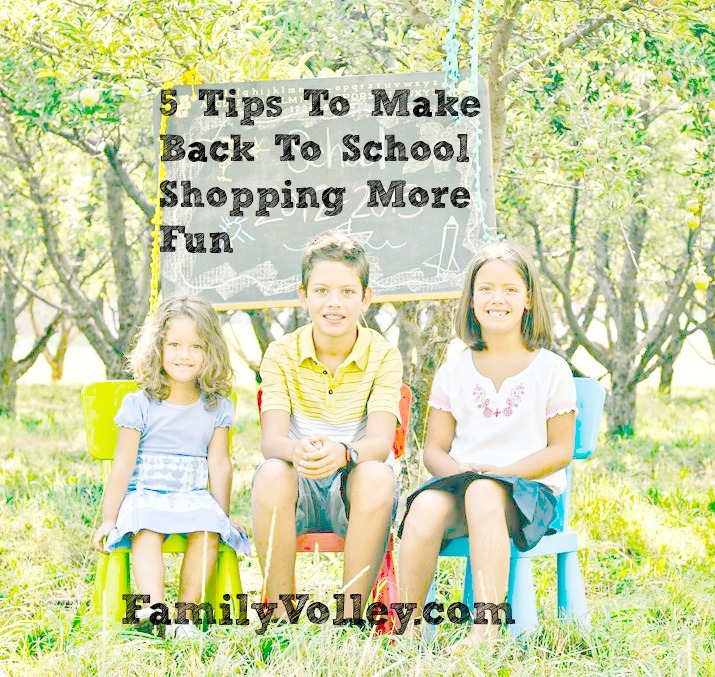 Here are a few tips to help make back to school shopping more fun for the whole family. 1. Start with the school supplies. Teachers have probably started sending home the lists of school supplies each of your children need. Most kids still get excited about backpacks, new binders, crayons, pencils and markers. Instead of starting with clothes shopping, start with the fun stuff. Plus, school supply shopping takes less time than shopping for clothes which means kids will have more tolerance for the process. This is also a great place to let your children express their personalities. There are clothes we won't buy our kids, and trends we won't follow. But if our daughter wants her backpack to be tie die with peace signs, so be it. Better than on her pants. :) (Not that I have anything against tie die or peace). When possible, leave the other kids at home and make back to school shopping a special experience for each child. Make a day of it. You could even add a fun treat like an ice cream cone before or after, or a quick lunch at your child's favorite restaurant. This can give you and your child a few minutes to chat, break the ice and bond. It can also take a lot of the focus off the shopping and put it on the fun stuff. 3. Ask for their options and feedback. When our children are small we can make more of the decisions without consulting them. As they get older, give them choice. Ask them what stores they would like to visit. Ask them what items they would like to add to their wardrobe. Ask them what they need and what they want. Giving them choices, wherever possible will help our children feel in control and they will be more likely to cooperate and support shopping for back to school. 4. Have clear expectations before hand. Take a few minutes to have a conversation about what is going to be acceptable and what isn't. Can your kids buy any style clothes they want? Are there certain stores that are not acceptable? What about a budget? If your kids are old enough you can talk about how much can be spent. Making expectations clear before hand gets you and your children on the same page and can save you from dressing room melt downs. 5. Leave the kids at home. There are many children who don't care about back to school shopping at all. That is okay. They do not have to go with you. Measure them for sizing, and sit them down for a fun "what do you like" quiz. Take inventory of their favorite colors and styles and save the stress. Keep your receipts so you can return the things they don't like, or that don't fit. Then when you get home, have a fun "try on session". With three kids to clothe for school, we are always looking for great deals. This year we added a new favorite store to the list, Gordmans. After visiting last week, it is already one of our daughters favorite places to go. Gordmans carries name brand apparel for all ages at up to 60% off. They carry everything! Footwear, fragrances, furniture, clothes, even toys. On top of that, their stores are fun! Our whole family had a blast. They have a coloring station where younger kids can watch TV while older kids are shopping, and a "grandstand" in the men's department where you can watch sports. Plus, Gordmans wants to save you money and thank you for shopping. Their gRewards loyalty program gives you points for every dollar you spend and a $10 reward for every 200 points you earn. Remember, when it comes to back to school shopping, it is all about making it a good experience for everyone. The last thing we want is for our kids to look back and have bad memories of being dragged from store to store or being forced to wear things they didn't like. They will never like back to school if that is the case. Could you use a little extra spending money for back to school? Be sure you enter the sweepstakes for $1000 + $100 to Gordmans. All you have to do is reply to the conversation. Quick and Easy. Good Luck! I am all about leaving the kids at home! good advice! It looks clear. It’s so great posting and also informative for social shopping users. The posted information is helpful for all. Good to all.